Rattlesnake Creek Watershed Group is hosting our 3rd annual Rattlesnake Fall Festival on Sunday, Oct. 26th, at Ten Spoon Winery from noon till 4:00 p.m. We’re co-hosting the event with our friends the Big Sky Beekeepers for their annual Bee Fest. The festival is also a fundraiser for RCWG; suggested donation at the door is $3 adults, $1 children. Music by Headwaters, children’s games, food trucks, wine, & vendors. Bring the kids and hang out with neighbors. To celebrate the Rattlesnake’s abundant apples and pears, RCWG will be pressing and sampling fresh cider at the festival. Harvesting and using these fruits helps keep bears and wildlife out of our yards and thus keeps people and animals safe. Residents can bring fruit to the festival for pressing, or contact RCWG in advance for pick-up. RCWG is raffling off a West Yellowstone Getaway Package, with a Family Membership to the Grizzly and Wolf Discovery Center, donated lodging, and other goodies. Tickets are $5 each, $20 for 5. There will be other prizes too and a silent auction including items from local vendors. Big Sky Beekeepers celebrates bees and beekeeping with demonstrations, children’s games, a display hive, honey sales, and more. We hope to see you at the Fall Festival! $5.75, buy your tickets at the door or online through fandango.com. The first 50 (maybe more!) “Bears” ticketholders will get a special bear-related door prize (one per family). Pick up at the table in the lobby. Bear experts (including Jamie Jonkel of Montana Fish Wildlife & Parks) will introduce the movie and answer questions afterwards. Bear safety information will be available. This year’s festival will once again feature a Recipe Contest. If you’re looking for ideas, check out some of the recipes entered in last year’s festival. What you can enter: Anything made with apples! Last year, submissions included breakfast rolls, ice cream, fizzy cider, apple leather, apple cake, apple salad, muffins, applesauce, and more. The apple tree is the limit! Make enough for two judges to taste, and then for the public to taste afterwards. (4-6 servings) It would be helpful (but not required) to include a serving utensil that you wouldn’t be sad to lose. Please have your submission in place for judging by 1 p.m. Include a recipe that is typed up with no name of cook/creator or identifying features on it. Indicate if the apples used are from the Rattlesnake. Your dish will be checked in when you arrive. Judging begins promptly at 1 p.m. and all dishes must be ready by then. Judging may take an hour, whereupon winners (and prizes) will be announced. Keep an electronic version of the recipe. With permission, winning recipes will be posted on the Rattlesnake Creek Watershed Group website, and will be requested & transferred by email. Rattlesnake Creek Watershed Group is having our annual Rattlesnake Fall Festival on Oct. 20th. Once again it will be held at Ten Spoon Winery, from noon till 4:00 p.m., with free admission for everyone, refreshments (some free, some available for purchase), cider pressing, and assorted fun and games. We’ll post more information here and on our Facebook page soon. Meanwhile, there are still plenty of apples (and pears, plums, etc.) on Rattlesnake fruit trees. The Great Bear Foundation organizes volunteers to pick and glean fruit in and around the Rattlesnake; if you’d like to volunteer please call them at 406-829-9379 or send email to info@greatbear.org. You can also contact them if you have fruit trees and would like some volunteer assistance. You can even keep some or all of the fruit if you’d like. You can also contact us for more information, either by email or through the easy form on this website, and we can steer you toward the appropriate experts for help in the Missoula area. Friday, August 23rd, 5-8 p.m. Please join members of the RCWG and the Rattlesnake community for a fun, family-friendly evening tour of Chicken Coops, Beehives, Garbage Cans & Cages, and more. The tour can be completed by bike or car, self-guided or as a guided tour, starting from Greenough Park where tour maps will be distributed, and ending at the Ten Spoon Winery beehive. You’ll find the RCWG table at the Greenough Park picnic shelter at 5:00 p.m. on Friday, August 23rd. Get information and a tour map here. Head out on your own with a mid-point check-in stop at Pineview Park. Or if you prefer, stick around Greenough and at 5:30, join Great Bear Foundation expert Chuck Jonkel on a tour of “Greenough Park from a Bear’s Perspective.” A guided tour of the featured Rattlesnake bear-safe cans, cages, coops and hives will depart around 6:00. The tour should take about 1½ hours. At the finish, RCWG will provide information and refreshments, and interested visitors can walk over to the nearby Ten Spoon Winery visitor room to buy a glass of wine. Event sponsors include Missoula Parks and Recreation, Defenders of Wildlife, Montana Fish Wildlife and Parks…. 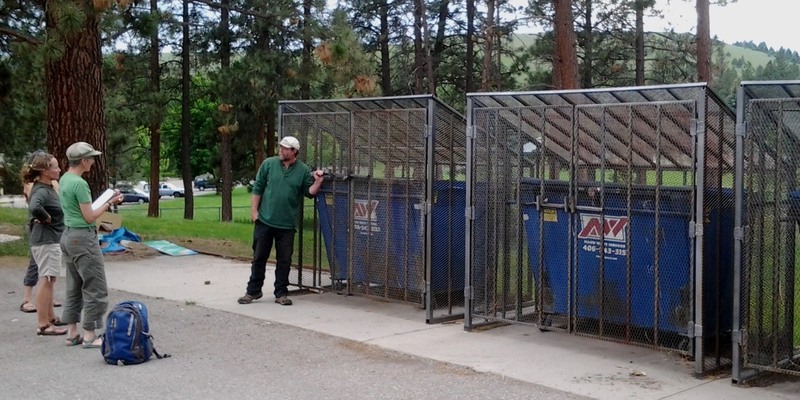 Bear-resistant dumpster cages at Rattlesnake Middle School. In 2013 the RCWG plans to continue our efforts at understanding, managing and improving the relationship between the Rattlesnake Valley’s human residents and bears. This will include coordinating management of apples and other fruit trees, along with other activities to reduce the incidence of unwanted human-bear interactions that put both people and bears at risk. Our first activity of the year will be a community meeting on March 18th March 19th (updated). Read more about the meeting and take our poll on bear attractants. Black bear in open space below Mount Jumbo Saddle trailhead, June 2011. Photograph by Eric Edlund. Update Sunday, October 28th, 2012: Bear Aware Apple Share Festival at Ten Spoon Winery! Free and fun! Read more about it here. Update Oct. 2012: Mark your calendars for the Bear Aware Apple Share Festival @ Ten Spoon Winery, Sunday October 28th, 12-4 p.m. More details on this website. Update Sept. 2012: Bears are active in the Rattlesnake now! 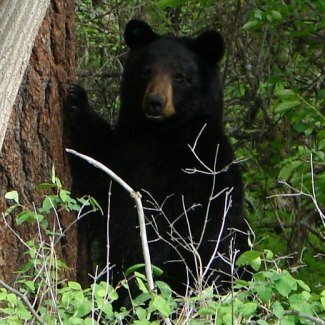 Please go to missoulabears.org to report sightings or for guidance on preventing bear-human conflicts. Update 9/10/2012: Volunteer! Fill out our contact form if you need help harvesting your own fruit trees, or if you want to help out by volunteering with Great Bear Foundation or RCWG to pick apples around the valley. Thanks! Update 9/12/2012: Read more about Rattlesnake apples and bears in today’s Missoulian. The RCWG has received a grant from the City of Missoula to coordinate a collaborative Rattlesnake Bear Aware Apple Share project. Bears populate the Rattlesnake Valley from top to bottom, and bear-human encounters are now a persistent problem, especially when fruit ripens in the Valley from July to November. 4) Celebrate our work during a fall Bear Aware and Apple Share event at Ten Spoon Winery. The Bear Aware Apple Share project is just getting started and we’d love your help. Contact us through the links on this website, or “like us” on Facebook. Thanks! Note: Please check out Missoula Bears for guidance on protecting bears by keeping them out of your yard, garbage, fruit trees, etc. Go to the missoulabears.org website to report bear sightings; if the situation requires a more immediate response, contact Montana Fish Wildlife & Parks 406-542-5500 or call 911.